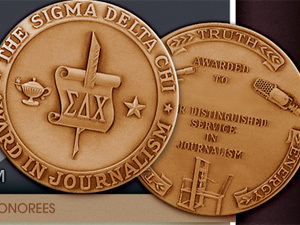 I’m pleased to announce that I have been honored by the Society of Professional Journalists (SPJ) with a 2012 Sigma Delta Chi Award for excellence in journalism in the category of Research. In fairness, the obit writer got to the important stuff about her scientific career in the second paragraph, and The Times’ headline also helped communicate that this was a woman of significant accomplishment. The Times quickly saw the error of its ways, and revised its opening paragraph. And to tell you the truth, I am less upset about the sexism in the obit than the sheer lack of quality in the writing. No one deserves a trite obit, particularly if your career has been both impressive, and in some ways, heroic. Journalism is about letting subjects – even deceased ones — speak for themselves. I am not going to cast any feminist darts at the author of the piece (as that has already been covered in many other publications). I can well imagine how it may have happened. On deadline, you are asked to write an obit. You contact the son, who talks a lot about his mother as he knows her. You’ve got a lot of background info, and some good quotes. You pull more off the internet. You’re trying to write something a bit arresting. The trouble is, you haven’t talked to enough people, and you haven’t let the subject speak to you, though the material is right in front of you. If the real Yvonne Brill treasured her stroganoff over her rocket propulsion patent, so be it. But anyone who continued to push for more recognition for women scientists while battling breast cancer, likely cared deeply about her work, something that she devoted her life to while still raising a family. Only after giving us information that made the obit muddled and trivial – such as how she met her husband and that neither of them cared for square dancing, did the obit give us a telling detail about what she did the last week of her life, a detail which, if I had been writing this obit is what I would have led with. Patrick Pexton, The Post’s outgoing ombudsman, had implied money problems were driving the change. The Post’s management denied that money was a factor, explaining rather that different times required different measures. They contended that the rise of the Internet, the proliferation of online media critics, and the ability of readers to comment directly about stories or to email reporters ensured enough accountability. So The Post no longer needed an independent, presumably thoughtful, journalist, to publicly assess its performance. Instead, what was really important was responding to individual complaints from readers. While I have liked Pexton’s work in the past, I criticized him recently for heaping unnecessary praise on reporters for simply doing their jobs, and I must say this explanation for the elimination of the ombud is also just plain silly. The fact that readers can post comments on Post stories or contact Post reporters electronically in no way means that the paper no longer needs an independent assessor of how it measures up to journalism’s highest standards. Outside media commentators lack the ability to get the attention of the paper’s editors, or have the power to defend the paper from accusations of bias or unfairness the way an independent ombudsman can.